2.1 Review of Weeks 1&2: all questions answered! Review of Weeks 1&2: all questions answered! E. coli do not normally respond to light but a recent publication describes a combination of genes that lead to light-responsive expression of β-galactosidase in E. coli. Recall from your study of the lac operon in biology classes that β-galactosidase is an enzyme encoded by the LacZ gene. Normally the protein cleaves the disaccharide, lactose, into two monosaccharides, galactose and glucose. For the bacterial photography system, the "coliroid" cells producing LacZ cleave an indicator compound, giving rise to a black precipitate. When the cells are grown in the dark, transcription of LacZ is high and the indicator in the media turns black. When the cells are grown in the light, there is very little transcription of the LacZ gene and the media’s natural color (yellowish) shows through. In designing a synthetic biological system it can be helpful (to you and to others) to describe the system using a high level design language that can simplify or "abstract" what's going on with the system. For example the bacterial photography system might be depicted as two key devices, one device that detects a signal and a second device that generates an output upon receiving information from the first device. Such a “black box” depiction of the system's operation enables easy re-use of the devices by others as well as helpful specifications for the needed connections between the devices (versus the materials needed for operation within them). For example, light is the input for the bacterial photography system, but it's straightforward to retask the system as a chemical sensor instead: just swap out the first "input sensing device" from one that's sensitive to light to one that's sensitive to your chemical of interest. Similarly, the output of the bacterial photography system is a black colored product but imagine hooking up the light sensing input device to chemotaxis as the output...then the cells might swim to the light rather than turn a color in response. A Sensor: an input detection device which, in response to dark, produces a signal. An Actuator: an output generating device which takes an input signal from the first device and produces a detectable output. 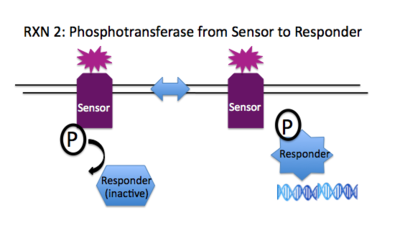 The devices are connected through the two-component signaling pathway. We will have a short presentation about 2-component signaling pathways before you launch into today's studio work. The slides for that presentation are here. Computer-aided design (CAD) is a hallmark of several mature engineering disciplines, like mechanical engineering or civil engineering. These engineers can rely on computer simulations to reliably predict the behavior of a car or a bridge, rather than run a hundred cars into walls or over bridges to see how those cars and bridges do. Biological engineers have fewer good CAD tools at their disposal. More often, at least for now, run laboratory experiments to test a system. But wouldn't it be nice (and quicker and less expensive too!) to try a few things on a laptop first? And then, with some good biological designs in hand, we could turn to the bench with more confidence, having eliminated the clear failures. 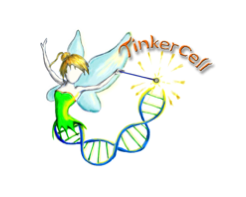 One early effort at a CAD tool for synthetic biology is Tinkercell. This program was developed by engineers at the University of Washington and it allows you to visually construct and then simulate/analyze a biological network. With the instructions that are here, you can use Tinkercell to build the genetic circuit that underlies the bacterial photography system. For those who would like to read more about the TinkerCell CAD tool, you can find the details in a Journal of Biological Engineering article that you can find here. The TinkerCell application has been downloaded onto the class laptops, or you can download it onto your computer for free from here. The instructions in this tutorial were written for the Mac-based version of the program. If you are running TinkerCell on a PC, you may see some subtle differences. What: what problem or opportunity are you thinking of focusing on? How sweeping or focused is this idea? How: what approach could you take to make a dent in the problem? What if if your project is fully successful, how big a difference could it make? what concerns does it raise? What else are there other technologies that can be used/have been used to address this area? Dunno how big are the gaps in what you know? how much is completely unknown or unknowable? To solidify our understanding of the bacterial photography system and the role of abstraction and modeling in biological engineering, we have two more activities today. In the first, you'll explore a different kind of model for the system, namely an electronic one, and consider the limitations and advantages for thinking about cellular circuits in this way. In the second activity, you'll develop a bacterial photograph yourself. You'll need to understand the system at a very different granularity to do this (e.g. antibotics? temperatures? volumes?) and you'll get to decide what image to develop as well. With any luck, these will both be fun ways to spend the hour and useful exercises for grasping the details and the themes associated with this engineered biological system. We can mimic the circuitry in the bacterial photography system using electrical components. An LED: an actuator that responds to a current input by emitting colored light. We also include a resistor in this box so we don't burn out the LED. The devices are connected through an operational amplifier and a resistor of varying impedance. We can thus use these two devices to build a circuit that will operate similarly to our bacterial photography system: the photodiode will sense light and generate an electrical signal that will be detected by the LED which produces a color. Depending on your goals, it might be sufficient to build the circuit with the largest resistor in place for the OpAmp, since this circuit should behave identically to the bacterial photography system (i.e. the LED on in the dark and off when the flashlight is shining on the photodiode). 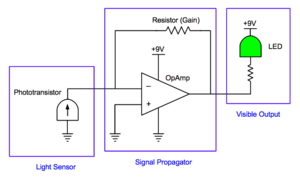 If you'd like to explore the issue of "gain" in the signaling system, then the resistor associated with the OpAmp can be swapped out for smaller ones, and the system can be observed to behave less digitally since the gain will be proportional to the resistance.The instructions for this build are here. As you work through this exercise, consider how the lessons learned from experimenting with an electronic circuit would map to the engineering of biological systems. For the second part of today's class, you get to use the bacterial photography system itself. You’ll plate a layer of cells on indicator medium, and then incubate the dish with a mask until next time. You and a partner can pick any image you'd like to develop. You expect the areas of the plate that are grown in the dark will turn a dark color, and the areas grown in the red-light to stay light colored. The bacterial photography system was one of the very first successes from the iGEM summer competition. It provides an instance proof that a small group of motivated undergraduates and some clever advisers can engineering biology to do their bidding. The project also highlights how an understanding of basic biology (e.g. the lac operon and two component signaling) can lead to new applications when refined and improved. Some media is prewarming in a 42°C waterbath for you. The media is traditional LB supplemented with ferric ammonium citrate and “S-gal,” an artificial substrate for beta-galactosidase. When the enzyme cleaves S-gal in the presence of iron, a black precipitate forms changing the color of the media. The media also has agarose so it will harden as it cools. Make sure you have an empty falcon tube (15 ml), an empty petri dish, and an aliquot of antibiotics and cells. Add a 5 μl aliquot of 75 mg/ml ampicillin, a 15 μl aliquot of 34 mg/ml chloramphenicol, and a 5 μl aliquot of 30 mg/ml kanamycin to the tube. The antibiotics will maintain the plasmids and reporter gene in the bacteria as the cells grow. Pour 15 ml of molten media into the tube and invert to mix but do not allow the media to remain at room temperature for long since it will begin to harden as it cools. Add the 100 μl aliquot of cells to the tube of media + antibiotics. Invert as before. Pour the 15 ml volume into a Petri dish and allow the media to harden on the table top (~10 minutes) before moving the plate. Please go wash your hands. While the media is hardening, plan the mask you'd like to use. Generate a computer file with this image and then transfer it to the class USB thumb drive (provided). As you choose an image, remember that the goal is to have each cell growing distinctly in the light or dark. Remember that light can bounce around edges and may blur the resulting image if the black and white are highly intermingled. In general, it’s better to have a dark background and a light image rather than the other way around. Finally, remember that the image should be sized to fit on the back of the petri dish, in other words, it should be ~2 inches square. Once it is printed, the mask will be taped to the back of the petri dish. The sample will be placed in a 37° incubator, media-side up under the glow of a red filtered light (0.08-0.15W/m2 650nm range) for 24 hours. You'll get to see your developed image next week! Before next Tuesday please take an hour to read the essay that Paul Berg wrote about the 1975 Asilomar conference in Nature magazine in 2008 for their series of essays called "Meetings that Changed the World." His Nature essay is here. To complement his view of the meeting, please also watch the interview with Victor McElheny, former science journalist, that is available through the Cold Spring Harbor DNA interactive site. This clip is called "why Asilomar is a poor model for the interaction of science and society. And just so you don't think this idea of self-regulation and a moratorium on research is a historical relic, please read the last paragraph of this recent letter in Science magazine, which calls for scientists to set aside for a short time further research on flu virus with enhanced transmission properties. Next week, we'll start with a short discussion of these materials, and then watch video taken in 1976 in Cambridge that captures the public reaction to NIH guidelines about a new kind of research. This page was last edited on 22 February 2012, at 19:16.